I've just poured a delicious cup of Nescafé Clasico. I'm not sure it was a smart move. It's really hot in Seattle right now, and my apartment feels like a furnace. I need to send some emails and take care of some admin stuff, but I thought I'd dive into some news first. Coffee + procrastination. Look at the following images from the header of a Fox News article. What do you think the article will be about? What will the tone be? "Sen. Rand Paul called Monday for President Trump to revoke former CIA director John Brennan's security clearance, as he questioned whether the Obama-era spy boss was “monetizing” his access to sensitive information in his new role as a pundit." "“Is John Brennan monetizing his security clearance? 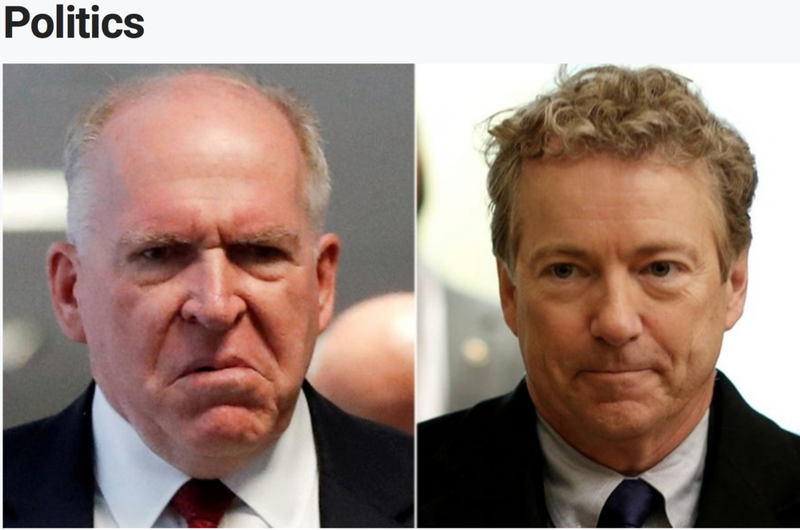 Is John Brennan making millions of dollars divulging secrets to the mainstream media with his attacks on @realDonaldTrump?” Paul tweeted early Monday." "Brennan joined NBC News and MSNBC in February as a contributor and senior national security and intelligence analyst. A spokesperson for the networks did not immediately respond to Fox News’ request for comment on Paul's tweet, which did not list any specific allegations." "The former CIA director has been a consistent and harsh critic of the president, blasting his performance with Putin in Helsinki as “nothing short of treasonous.”"
"“We have lots of questions for John Brennan and he will definitely be sought by the committees for an interview,” Goodlatte said on “Sunday Morning Futures.” “This is an extremely disturbing thing to see both he and [former FBI Director] James Comey, supposedly impartial government officials carrying out their jobs in very important areas in intelligence gathering and law enforcement, express the kind of extreme bias that they’ve shown—which I think reflects quite accurately what they were doing back in 2016.”"
- Verdict: This article is a mess. It just seems lazy. The article should have answered basic questions about Brennan's security clearance, including the type of information Brennan is privy to as a former CIA Director and the type of information Paul thinks Brennan is receiving. It's difficult not to conclude that Fox News simply wanted to amplify Rand's accusation.